Habakkuk is not a minor prophet who gets much attention. It is a book that is difficult to read since you have little hope there as he complains to God and the answer is not quite to his liking. It just doesn’t “preach” in our day of itching ears, prosperity and easy living. This week I begin a sermon series on Habakkuk. As you begin you aren’t sure if the resources will be worth your while. You aren’t sure if you are going to get helpful perspectives and cover historical, exegetical, and practical issues well enough to prepare you to bring the Word to God’s people. Only time will tell if I refresh weary souls. Calvin’s Commentary on Habakkuk is my interaction with the historic community. I try to pick at least one older commentary. We shouldn’t ignore how it was interpreted in the past. We stand on their shoulders rather than figure out everything from scratch. You generally can’t go wrong with Calvin. Quick Review: Apparently general rules can be broken. In his lectures on Habakkuk, Calvin seemed to have very different interests than I did regarding the text. There were a few application points that I used, but for some reason it was largely an exercise in missing the boat. Perhaps by me. I often read him last and by then my ADD was flaring. Maybe that was the problem- a me issue. D. I’ve got O. Palmer Robertson’s volume in the New International Commentary of the Old Testament series covering Nahum, Habakkuk and Zephaniah. This is my more technical commentary for Habakkuk. Robertson is a capable scholar, so I feel like I’m in good hands as I seek to tackle any of those more technical questions. Quick Review: This commentary covers three of the minor prophets. Thankfully it was not superficial. It could have been more in-depth but I did find it helpful at some key points. While not as valuable to me as some others, it was useful and I’d use it again. Similar to that is Walter Kaiser’s volume, Micah -Malachi, in The Communicator’s Commentary Series. It should focus a bit more on how to preach it. We’ll see. Quick Review: I was not impressed with this commentary. Granted, it spans from Micah to Malachi, but I thought that it didn’t go into enough depth. It didn’t contribute much to my understanding and application of Habakkuk. I think I could have saved time by not reading this, but it didn’t generally take long to read. At times I disagreed with his conclusions, but there wasn’t enough background given for him to change my mind about his views. This is a snorkling, not suba nor deep sea diving kind of commentary. I read some good reviews on Habakkuk by Heath Thomas, part of the Two Horizons Old Testament Commentary series. This is also more to the exegetical/technical side of things. It offers to bridge the gap between biblical and systematic theology. Quick Review: Initially I was disappointed. I was not thrilled with the layout and wished that I’d begun to read the volume before the series began. After the commentary on the three chapters, he had chapters on some of the themes that arose in the book. I never got to those. After the initial disappointment I found that his verse by verse commentary was very helpful. At times I was discouraged as he claimed a particular portion was among the hardest passages in the OT to translate/interpret. Hard words on a hard topic. This would be one of the volumes I’d encourage you to read to grapple with Habakkuk as he grapples with the justice of God. John Currid often provides lots of archeological & historical background in his commentaries. As a result, I picked up his volume Habakkuk: The Expectant Prophet. It is not very thick, but I expect to get some good nuggets from it. Quick Review: I think this may have come from a sermon series he did. I was not disappointed in the slightest by this volume. It was probably the most helpful book I read. He answered some exegetical questions, and had some. great illustrations that I used. There was some ANE background on subjects like sieges. I got more than nuggets from this one. Even shorter is D. Martyn Lloyd-Jones’ (I’ll never say it the same after watching the Lego Ninjago Movie with the kids) From Fear to Faith: Studies in the Book of Habakkuk and the Problem of History. 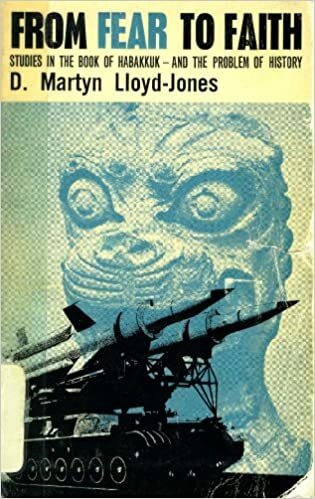 The cover is pretty ugly with a rocket launcher and some B-movie monster (okay, actually a statue of some ancient idol that looks like a B-movie monster). Go figure. Maybe in addition to watching wrestling with the grandkids he watched monster movies. Quick Review: If you are looking for exegesis, help understanding what Habakkuk means, wrestling with textual issues etc. This isn’t really the book for you. L-loyd goes after the bigger picture in this book. While written in the 50’s with the threat of Soviet communism looming large, he does provide some good direction in helping you to make those epochal adjustments from Habakkuk’s day to ours. There were some great quotes in this book. Sadly, my sermon on Habakkuk 1:1-4 did not record properly.